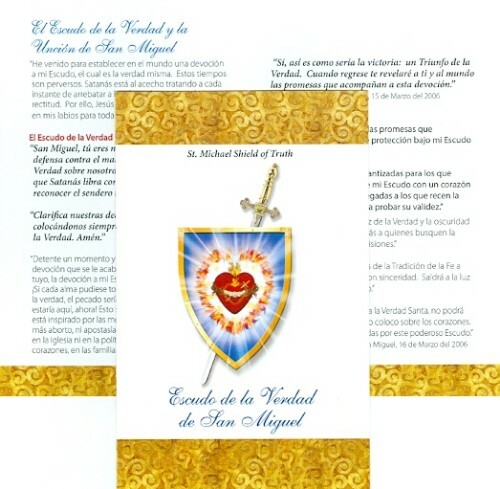 The front of the bi-fold prayer card shows the image of the Shield of St. Michael. 1. Those who seek Holy Truth in decisions will be made to see the Light of Truth and the darkness of Satan's lies. 2. The truths of the Tradition of Faith will be revealed to those who seek this with sincerity. The evil of liberalism will be brought to light. 3. Satan, who opposes Holy Truth, will not be able to penetrate the Shield I place over hearts. His lies will be repelled by this mighty Shield. The back of the card has an explanation of the image.